Know What You Eat: Mohanthal or Chickpea (besan) flour fudge is a Gujarati delicacy most often made during any auspicious occasions like Deepawali | Diwali. It can be described as chickpea (besan) flour fudge spiced with cardamom and topped with sliced Almonds. It can also be served as a sweet snack along with some spicy mixture, or as one in many sweets we make during this time of the year. Since this is a traditional sweet I have tried to compose it in a step procedure along with some pictures, so it becomes easier for first timers..
1.. In a food processor mix together, besan (chicpea flour), 2 Tbsp Ghee and 2-3 Tbsp warm milk.Put it on a pulse mode and pulse it together for atleast 4- 5times until you get nice coarse powder something similar in the picture. Set aside. 2.. Simultaneously on the other side make the sugar solution and keep it ready, for that you will have to mix together sugar and just enough water to cover sugar and boil until you get 2 thread consistency for sugar syrup. Take if off from the heat. Allow it to cool. 3.. In a wok, add this mixture with rest of the ghee and roast in on a medium flame just like in picture 2 of 1 for until you get nice aroma and light brown color. 4.. If you are using Khoya | Mava, you will have to add it at this point of time and roast for another 5-7 mins. 5.. Take off the heat once it has golden to slight brown color. Allow it to cool. 6.. Cooling of both sugar syrup and besan mixture is very important. Do not miss this step of the recipe. If the either one is hot it will bring out all the ghee and form an extra ghee layer on top from the besan mixutre which would be then difficult to mix in. 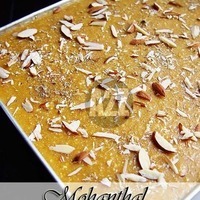 7.. After cooling mix thoroughly besan mixture with sugar syrup, add crushed cardamon powder, kesar (saffron strands). Keep stirring until a homogeneous mass is formed. 8.. Pour it into a greased dish (with ghee), allow it to set and sprinkle sliced Almonds over it. 9.. Cut into a diamond or square shape. and store it in air tight container for later use... Enjoyyy!! !